This all creatures animal exploitation photo gallery about deer is being presented to show the public the difference between the cute animals we see in advertising and picture in our minds and the reality that exists in the world. and these two babies who were eating berries that fell from a tree. (Deer - Cull - 001) A deer cull is a euphemism for the killing frenzy that government agencies use to hide their true intent. This and the following video stills were extracted from a nighttime video taken by SHARK of a cruel net and bolt operation in Green Valley Forest Preserve, which is part of DuPage County Forest Preserve District in Illinois. In this scene the deer are being bated with food to enter the explosive net capture zone. (Deer - Cull - 002) The explosive charges are detonated, and the net flies up into the air over the head of the deceived and unsuspecting deer. As this video still shows, the explosions happen so fast that the deer don't have time to react. (Deer - Cull - 003) The deer now begin to bolt in terror from the noise and the capture net soaring above their heads. The one deer can be seen jumping almost vertically into the air. (Deer - Cull - 004) The terrified deer begin to run away as the smoke of the blast surrounds them and the net begins to settle down over their heads. (Deer - Cull - 005) The panicked deer begin to run into the capture net. 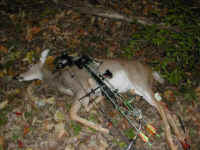 The deer to the left of center can be seen falling as she becomes entangled in the net. (Deer - Cull - 006) Now both deer have become entangled in the net, and their slow agonizing death. (Deer - Cull - 007) The deer are becoming more entangled in the net and falling, while the smoke of the explosive charges lingers in the air. (Deer - Cull - 008) The deer are doing everything they can to free themselves from the net, but they are unable to do so, and they are in real panic. (Deer - Cull - 009) The deer keep racing back and forth and stumbling as they try to free themselves from the net. (Deer - Cull - 010) As the deer become more entangled in the net, they try jumping up into the air only to be flipped over and landing on their heads. And remember, this is taking place at night when their vision is limited. In our opinion, there is nothing humane about net and bold killing operations. (Deer - Cull - 011) Then the deer run into each other and become hopelessly entangled together. This is when they can inadvertently cause serious injury to one another with their thrashing hooves. (Deer - Cull - 012) Once the deer become fully entangled, the killers come up to the net. (Deer - Cull - 013) It is hard to see exactly what the men are doing. They appear to be carrying large plastic bags and a captive bolt gun. We can see the panicked puffs of breath coming from the deer as the man prepares to shoot one of them. (Deer - Cull - 014) Even after apparently being shot with the captive bolt gun, the deer are very much alive, as can be seen by their frosty puffs of breath and their thrashing. The one man even stumbled as he tripped over one of the deer. (Deer - Cull - 015) The men stand around watching the deer slowly die. Before the killing began, the men were reported to have said that the killing was quick. So much for the truth of of hunter/killers! (Deer - Cull - 016) As the video scene ends, the men are still standing around and the deer who are still alive. We always wonder why the churches don't speak out against the cruelty committed upon animals. After all, doesn't the Bible teach us about the peaceable kingdom (Isaiah 11:6-9), and aren't we instructed to free the whole of creation from its present day corruption (Romans (8:18-23), and aren't we to pray for God heavenly will to be done on earth as it is in heaven (Matthew 6:10), where there is no death or pain (Revelation 21:4)? Could the problem be that most pastors are part of the carnage, and don't really believe what the Bible and the Lord teach us? 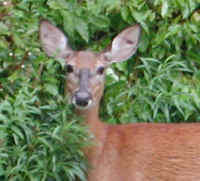 (Deer - Slaughter - 001) This, and the following series of images were extracted from a video by PETA which was taken at Musicon in Goshen, New York on 26 August 2007. The deer being slaughtered are fully conscious and show signs of fear and panic. 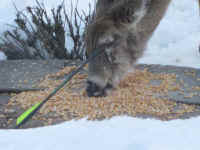 In order to control the deer in the kill box, and hold his or her head still, a slaughterhouse worker pulls on one of the deer's sensitive ears. (Deer - Slaughter - 002) Then a worker outside the kill box reaches over and also grabs the same ear. Notice the way he also holds up his other arm in from of his face for protection. They know the deer is panicked and fighting to escape, and they want to avoid injury as they kill the deer. (Deer - Slaughter - 003) A third slaughterhouse worker moves in to help control the panicked deer, and give the worker in the box area a chance to get a better grip on the deer's ears. (Deer - Slaughter - 004) The slaughterhouse worker in the killing box area now has a firm grip on the deer's two sensitive ears. 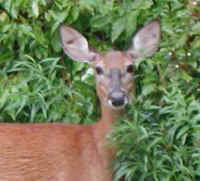 They knowingly do this because it causes the deer a great amount of pain if he or she tries to resist. In essence, they are torturing the deer. (Deer - Slaughter - 005) The slaughterhouse worker in the killing box then pulls harder on the deer's ears, causing his or her head to rise up and expose the neck. (Deer - Slaughter - 006) The slaughterer then reaches around the protection of the killing box door and quickly slices the deer's neck, causing blood to gush out. (Deer - Slaughter - 007) The slaughterer quickly steps back and the gaping slice in the deer's neck is clearly visible. It will take the deer nearly a minute and a half to become unconscious. (Deer - Slaughter - 008) Everyone lets go of the deer, and they quickly close the door of the kill box where the deer desperately thrashes around, and from where the sounds of the deer drowning in his or her blood can be clearly heard. (Deer - Slaughter - 009) After about a minute the deer stops thrashing, and the door to the kill box is reopened. A slaughterhouse worker reaches in and grabs the weak, but still conscious deer by the ears to drag him or her out on to a metal cart. (Deer - Slaughter - 010) As the deer is dragged out of the killing box we can plainly see that he or she is still trying to stand up, a really good indication of full consciousness. (Deer - Slaughter - 011) The still living animal is laid on the metal cart; the head is pushed back, and the throat is sliced again. (Deer - Slaughter - 012) The deer's head flops back on to the metal cart, and passes into unconsciousness and death. Proverbs 12:10 teaches us that people who are not compassionate to animals are wicked. God gave us an abundance of plant food; more than we could ever want or need. We don't need to eat animals and cause all this suffering and death. (Deer - Hunting - 01) A doe survived for several days with a hunter's arrow shot her nose, throat and neck. 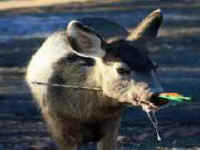 After four days the Colorado Division of Wildlife captured her and tried to save her, but they deemed the arrow had caused too much infection and she was rifle shot her to put her out of her misery. (Deer - hunting - 02) She traveled with the herd for days after having been shot with an arrow through her nose, throat and neck. The brutality of "sport" hunting is once again exposed for its barbarism. 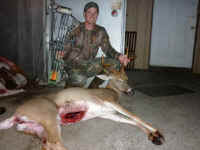 (Deer - hunting - 03) How long might this deer suffer? The poor marksmanship of some bow hunter once again causing extreme distress and horror...for the sake of the entertainment called "bow hunting." (Deer - hunting - 04) How proud he seems. Displaying all his weaponry used to murder a beautiful, non-threatening deer? Hopefully one day he'll be an ex-hunter. (Deer - hunting - 05) "Bow-hunting victory." Doesn't seem like much of a fair fight, does it? Massive metal weaponry versus natural, wild beauty.